Is it possible to have too much of a thing you enjoy? Well the short answer is, of course it is. Back in 2013 LD asked how much we liked baccarat as it was then possible to play 3 tables in one window at Bodog. Step forward several months and it’s now possible to have multiple live tables of your choice open at Evolution Gaming and Playtech casinos. Evolution were the first to launch Muti-Game-Play(MGP) in November with the option of having up to 4 tables open. 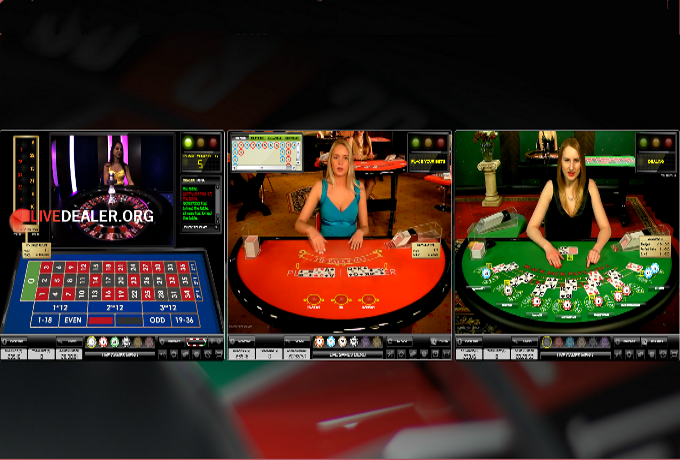 Playtech recently launched their own version, similarly called MULTI-GAME, which supports 3 tables. So how do they compare and contrast? It’s not the first time Playtech have ventured into multiple game play. Dual roulette has been around since 2012. Multi-Game adds another table and now you choose which games you want open. If you are fortunate enough to be playing at a casino that supports both the Playtech studios in Europe and Asia you get to choose from a wide selection of tables. All 3 tables can be the same game type, or any combination of roulette, blackjack and baccarat, but not poker. Once you have selected Multi-Game you can change the open tables whenever you wish (top right box on table). Playtech have redesigned the table layout on screen to fit the 3 tables in a slim vertical format. It fills a large portion of the screen, and is easy to see what you are doing. Unfortunately you can’t close tables and so you are stuck with 3 tables open. If you want to go back to single table play you have to close the Multi-Game window. Consequently, you lose your seat at a blackjack table, or risk your roulette numbers coming up while you are away. Sound can be turned on or off at each table, but there is no option to chat with the dealers. So it’s advisable not to visit a dealer you normally chat with or they may think you are ignoring them. Multi-Game-Play at Evolution is more flexible and allows you to have 2,3 or 4 tables open. Once you have opened a single table all you have to do is select the ‘Live Games Menu’ at the bottom of the screen and open more games by clicking on a ‘+’ symbol next to tables. Any combination of roulette, blackjack, baccarat and poker is possible. Evolution have left the table layout as it was. When you open extra games the table is simply shrunk to accommodate the change. 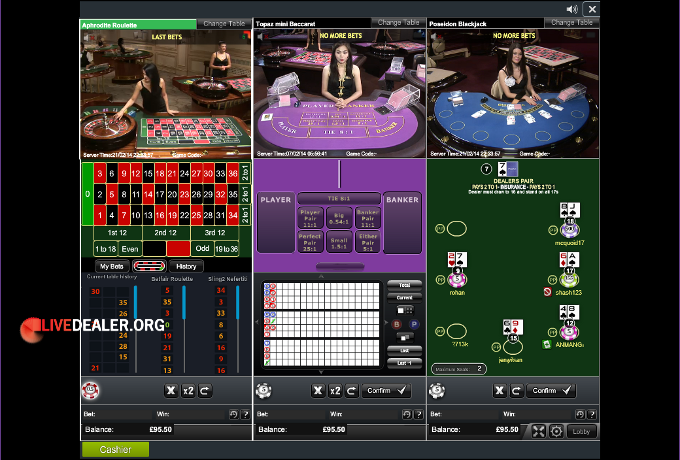 This approach results in a lot of wasted screen space for 3 tables compared with Playtech. Although the live image is still larger at Evolution. 2 tables fill the screen nicely, and some players may appreciate the option of having 4 open. A really helpful feature is the ability to enlarge any of the tables to full screen, then switch back to the multi-display (bottom right box on table). You can also close tables and go to a single table, without losing your seat, and so on. Chat is allowed, but it can become very confusing if you try playing and holding multiple conversations. Playtech’s version is arguably the better presentation wise. But, Evolution’s is more configurable and allows you to do more e.g. chat, enlarge table, close tables, keep your seat when switching modes. Although I doubt any players will want to change which casino they play at based on who has the better Multi-Game feature. So is Multi-Game play a passing fad or here to stay? Personally, I like my time at the live tables to be relaxed and don’t imagine I will ever play more than 2 tables. Nevertheless, based on a recent press release by Evolution it seems the casinos are onto a winning formula with increased wagers reported. Thanks for your perspectives Fester. I’m not sure about the multiplay thing…personally get distracted enough playing a single table, with on and off screen distractions. But as you say…plenty of players seem to like it.